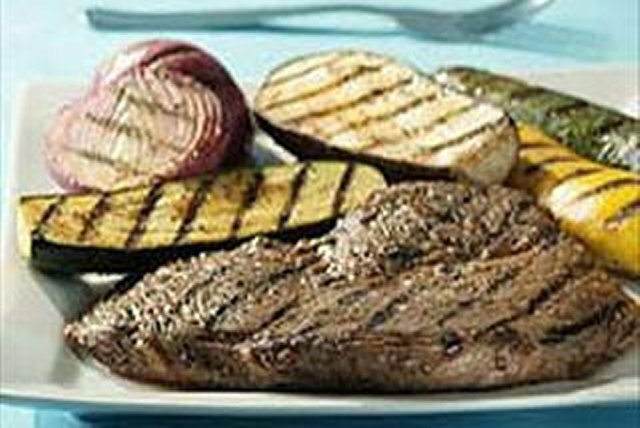 Eggplant, yellow squash and zucchini are at it again—this time adding their farmers' market appeal to a zesty Cajun-style grilled steak. Whisk first 6 ingredients until blended. Place steak and combined vegetables in separate shallow dishes. Pour half the vinegar mixture over ingredients in each dish; turn to evenly coat both sides of all ingredients. Refrigerate 30 min. to marinate. Heat grill to medium heat. Remove steak and vegetables from marinade; discard marinade. Grill steak 5 to 7 min. on each side or until medium doneness (160ºF). Meanwhile, grill vegetables 2 to 3 min. on each side or until crisp-tender. Cut steak across the grain into thin slices. Serve with grilled vegetables. Prepare recipe as directed, substituting 4 small boneless skinless chicken breasts for the steak, and increasing the grilling time for the chicken to 6 to 8 min. on each side or until done (165ºF).